Flashlights are an essential asset that can save you in an emergency. But even if you’re not encountering one, having the best flashlight for the money can help you traverse through your hike trail or find something from your house’s basement. Whether you plan on using your flashlight for your outdoor trips or just for everyday use, its essential you keep your budget in check. Therefore, for all those who are looking for flashlights that won’t make you break your bank, we’ve compiled a list of some top flashlights. We make sure all of the listed options are not only excellent but also offers you the best value for the dollars spent. 2 Buying Guide: How to Choose the Best Flashlight for the Money? 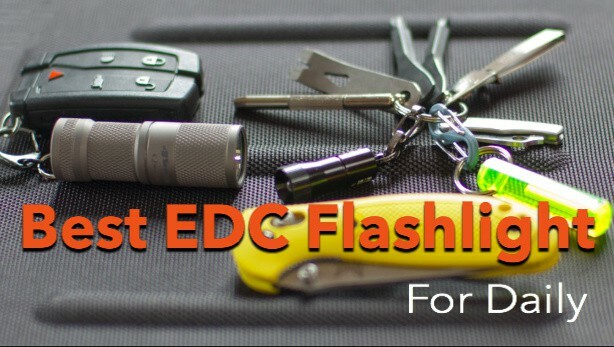 This list contains some of the best flashlights for different prices to fit all budgets. These options include best flashlight under 100, best flashlight under 50, best flashlight under 30, best flashlight under 20, and other similar options. So just head down and find out the perfect flashlight that suits your budget. This 250-lumen flashlight can be used to illuminate your vehicle, garage, living room or literally any place you desire. It has a runtime of around 7 to 48 hours when it’s completely charged. However, it does take a longer time to get charged fully as that will depend on the availability and brightness of the sun. The product takes around 7 hours for full charge using solar energy. However, you don’t need to worry if sunlight doesn’t work. The flashlight uses hand cranking to give you light too. Besides this, the flashlight offers multiple light options which include a flashlight, a floodlight, and a red emergency light. Furthermore, the product is mainly based on solar energy, but it also comes with a lithium 4400 mAh battery and integrated USB charging ports. Therefore, you can use it to power your cell phones or tablets too. This product costs around 80 dollars. Even though, the price makes it slightly more expensive than some other solar powered flashlights, but it offers more than they do and is certainly one of the best flashlights under 100. We have included another alternatively powered flashlight in our article similar to the first one. The only difference it does have is that its cheaper. The previous one was the best flashlight under 100, but this one is the best flashlight under 50 dollars. The Eton flashlight is more than just a flashlight – it’s a multi-functional device that contains a weather radio, outdoor radio, and a Bluetooth. The flashlight itself uses hand-cranking, solar energy, and a small solar panel to power itself. Alongside all these multiple options, the flashlight itself offers two light modes, a white LED and a red emergency light. In addition to that, the flashlight also comes with a USB port that can be used to power your device. Furthermore, the flashlight has a built-in 2000mAh battery which will last for 20 hours easily. Giving you the advantage in an emergency situation. The Streamlight Microstream flashlight is one of those very few flashlights that costs less than 20 dollars, yet they stand the test of time. It gives you an output of 45 lumens for around 2 hours. Constructed using anodized aluminum, this flashlight is corrosion and abrasion resistant. In addition to that, it has a scratch resistant unbreakable, polycarbonate lens. 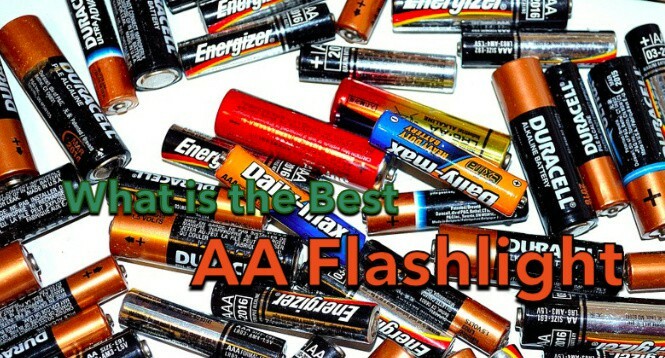 It works using AAA alkaline batteries which are readily available. It operates using a push-button tail switch for momentary or constant on operations. In addition to that, the product is also equipped with a pocket/hat clip for convenience. You can use this clip to attach the flashlight with your clothes or hat and use the flashlight’s beam without any hindrance. Lastly, the flashlight has all its openings sealed by O-rings which make the product IPX-4 water resistant. The Stanley Fatmax costs less than 50 dollars, which makes it very cost effective compared to the features it offers. The flashlight gives off 920 lumens and includes a stand that you can utilize to make the flashlight stand. Furthermore, the product uses rechargeable lithium-ion batteries to work. The batteries have a runtime of up to 7 hours on low mode and 1 hour on the highest mode. Another noteworthy feature about this spotlight is that it comes with both AC and DC adaptors which you can easily use within your home and or your car. Lastly, the product comes with a rugged pistol-grip handle thus making it super convenient for users to hold the flashlight. The Olight is our favorite flashlight under 50 dollars which is just perfect for when you’re “on the go”. This light is literally the size of a lip balm, measuring around 2.4 inches and weighing around 1.6 ounces. This makes the flashlight the best portable flashlight. However, despite being small the flashlight is pretty powerful and provides various light outputs, ranging from 0.5 lumens to 500 lumens. In addition to that, this product also has a beam throw of around 350 feet which is quite impressive. Furthermore, the flashlight is equipped with a pocket clip and a magnetic back. An interesting feature this product offers is the “sub-level” modes. These are those modes you can switch to by double pressing to get a higher high or lower medium. However, switching between these modes is a bit tricky as sometimes the strobe is initiated. Therefore, it’s not really advised to use the sub-level modes. Lastly, the product uses one RCR123 battery to work which unfortunately is not included with the package. The Thrunite Archer 2A V3 is the perfect product for those that require a flashlight which is close-range and can be used indoors. The Thrunite has a maximum lumen output of 500 lumens, but it’s various light modes allow you to choose a dimmer mode for indoors. The lowest mode is the firefly mode which gives an output of 0.2 lumens. Such type of flashlight is perfect for use around children and pets as it won’t glare directly into their eyes. 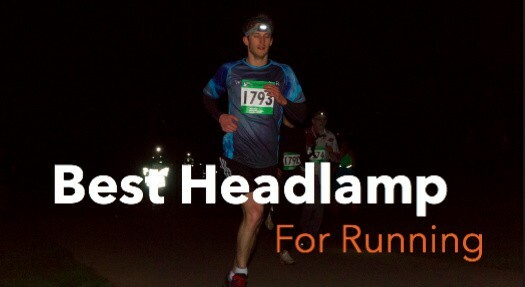 Another advantage that comes with such a low lumen output is that the flashlight doesn’t get too warm or overheats. Furthermore, the product uses AA batteries to work which are very easily available. The product itself is constructed using anodized aluminum with an anti-abrasive finish, making it durable and long lasting. Lastly, the flashlight costs just 26 dollars making it one of our top choices for best flashlights under 30 dollars. 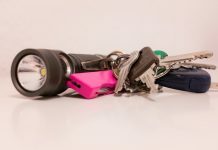 You might not think of a penlight to be included in the list of best flashlight for the money, but penlights aren’t of use only in the medical world. Many women prefer to carry flashlights that are compact yet stylish, these penlights are perfect for such people. The penlight can easily be stored and carried but will be readily available to provide you with a good amount of light. This product is constructed using the standard aluminum alloy Streamlight uses in their flashlights. Therefore, you don’t have to worry about accidentally dropping and breaking the flashlight. Furthermore, it gives a maximum lumen output of 11 lumens which is perfect to be used for finding things in your purse or to be used by a paramedic. Additionally, the product uses two AAA batteries to work which are included in the package, therefore, you don’t need to spend any extra money on the batteries. Lastly, the product comes with a lifetime warranty too. 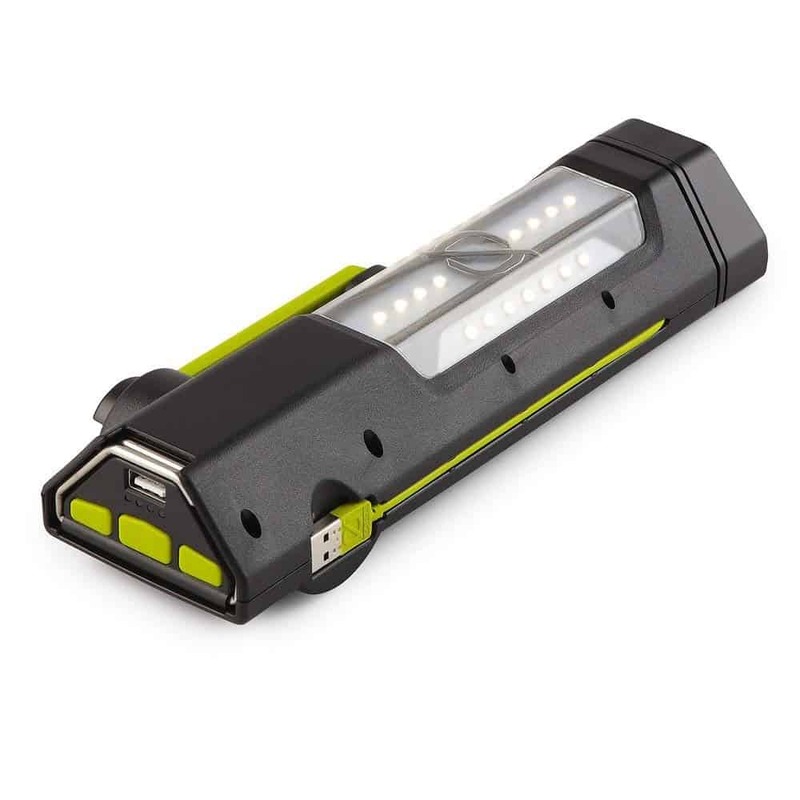 If you require a light that’s well defined to light a large area but still has some precision, the Samlite rechargeable flashlight is the perfect choice for you. Despite being under 30 dollars it gives great results. It gives a maximum output of 530 lumens and has a beam distance of around 1600 foot. It uses two lithium-ion batteries to work and has an average runtime of 5 hours and a charging time of around 3 hours. Furthermore, the product comes with pretty cool features. It comes with a USB port to charge your other devices with. It also comes with a hands-free shoulder strap and a hanging loop for use as a lantern. 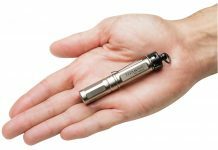 With a length of around 7 inches and 1.1 pound weight, this flashlight is super compact and easy to carry. It also offers six various light modes with a special blue indicator. Lastly, the product also has a display function to show you the remaining battery life which is super helpful. For those who are looking for the ideal every day carry flashlight, the Olight i3E is the perfect option. The flashlight is only 4.5 inches long and weighs just 0.16 ounces. Additionally, the flashlight is equipped with a small keyring. Thus you can attach it to your key bunch and carry it around. The flashlight operates by twisting the head, and although it’s powered by only one AAA battery, it gives off a pretty impressive output of 90 lumens. In addition to the bright lumen output, the flashlight also gives off a 144-foot light beam which is quite impressive. Furthermore, the flashlight is fully waterproof, with an IPX-8 rating, and impact resistant up to a 1.5-meter drop. Lastly, the flashlight costs only 8 dollars. Which is definitely worth your money and the reason it’s our favorite pick for flashlights under 20 dollars. Maglite flashlights are super popular among security and police officers as they’re heavy duty and reliable. However, they can be used by civilians for everyday uses as well. The Maglite is constructed using anodized aluminum that is anti-abrasive and weather-resistant. It costs only 30 dollars yet delivers impeccable results. The flashlight gives an output of 168 lumens only, but multiple reviews rave about the brightness of this flashlight. In addition to the bright light, the product has good battery life and can run for up to 80 hours before you need to replace its batteries. This makes this flashlight an amazing option for a survival flashlight. Because of its aluminum body and anti-abrasive finish, the flashlight is built to survive multiple drops and rough tasks. Furthermore, the flashlight also comes with a limited lifetime warranty. This flashlight has been specifically designed for underwater photographers or divers. But that doesn’t mean you can’t use it anywhere else. It works fine in other situations and acts as an amazing weatherproof light. The flashlight is constructed using a fluorescent material which makes spotting the flashlight in dark or murky waters very easy. It’s also equipped with an adjustable wrist strap which further aids the user in handling the flashlight. 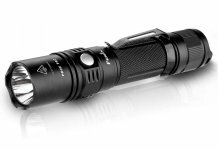 Furthermore, the flashlight is super bright and offers an 1100 lumen output using a rechargeable 18650 battery or three AAA batteries. Alongside that, the product offers various brightness levels and a strobe light. Constructed using aircraft grade aluminum, the flashlight is extremely durable and water resistant of IPX-8 standard. Therefore, you can go diving or even for a hike without ever having to worry about the weather conditions. Just remember to replace the batteries on time and rinse the light after every use. Also, did we mention that this flashlight costs just 15 dollars? Such features in less than 20 dollars, it’s a deal worth going for, and makes it the best flashlight under 20. Flashlights are great for lighting up areas, but sometimes they can become a bit annoying to use because you always need to hold them. Generally, it’s not possible to do something that requires two hands when you’re using a flashlight. However, the Nebo Flashlight was made keeping this in mind. This flashlight comes with a magnetic bottom which allows you to place the flashlight wherever you need it and then use it accordingly. The Nebo flashlight is perfect to be used as a work light. It’s constructed using an anodized aluminum body which makes it durable and long-lasting. In addition to that, the LED head of this flashlight is recessed which protects it from any damage. Furthermore, the flashlight offers a variety of light modes with an emergency red light mode. It gives off a maximum output of 400 lumens and a low output of 160 lumens. It works using 3 AA batteries which are included in the package. Lastly, the product costs just 19 dollars making it an excellent choice for people who are looking for affordable flashlight options. Buying Guide: How to Choose the Best Flashlight for the Money? We’ve listed down our top 12 products, but in case you need further clarity as to why you should choose one. Read through the buying guide below and hopefully, you’ll be able to choose the best flashlight for your money. What is the Bulb Type? Previously flashlight bulbs were mainly constructed using a halogen bulb and LED was a luxury option. However, nowadays pretty much all the flashlights have LED bulbs. It’s the standard option, and in the same prize as a halogen bulb, you get double the lumens and 50 times more battery life. In addition to that, LEDs are shock resistant and are available in various colors too. Therefore, take a look at what kind of bulb the flashlight uses and then make your purchase. We can compare lumen outputs and ratings for flashlights easily. Most flashlight companies offer various light modes but what it all comes down to is how easy it is to switch between these modes. If there’s only one button and you have to go through half clicks then full clicks to lock the mode and then go through all modes to get the perfect setting, it can be quite infuriating. Therefore, it’s preferable to have separate buttons for operating the flashlight and switching between the modes. Another thing to look for is the memory mode which simply means that the flashlights remember the last mode you used and switches directly to that when you turn it on. The battery life of a particular flashlight mainly depends on its size and battery type. The bigger the battery, the better the battery is generally. For instance, take the Maglite included in our list, it uses three D batteries and offers a run-time of 80 hours but feels very heavy. However, other smaller options included in our list offer runtime of up to 20 hours on the lowest setting and 2 to 3 on the brightest. All in all, it comes down to you how much weight are you willing to carry and how much brightness and battery life do you require. What Do You Need The Flashlight For? Sure, it’s really tempting to fo for the brightest flashlight but lower lumen models work just fine. Especially when you don’t want to divert a lot of attention to yourself as soon as you turn the flashlight on. For everyday situations, low lumen flashlights work just as well and have better battery life. 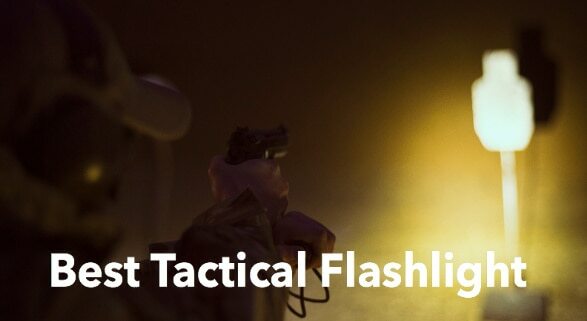 However, if you’re a police officer looking for a flashlight, you might need one that is bright enough to disorient or stun the attacker. In such a case, a brighter flashlight is the better option. And in case you’re still confused, just opt for a flashlight that offers a variety of light modes so you can switch between them as per your need. 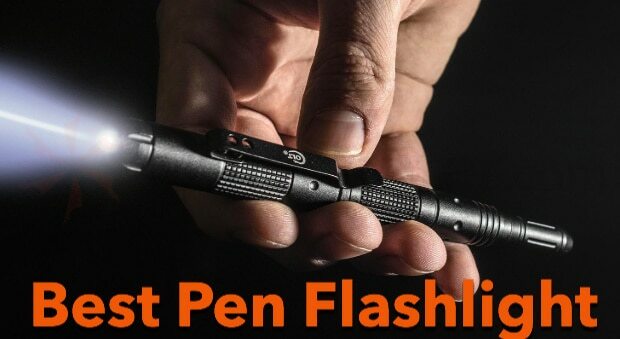 And with that, we are done with our top 12 picks for the best flashlights for your money in 2019. We hope this answered all your questions and helps you choose the best flashlight that perfectly suits your budget.